Chemicals and toxins are the last thing you want to feed your garden plants with. The market offers thousands of chemical-based pesticides and fertilizers. Although these are super cheap, they’re definitely bad for the environment, not to mention their detrimental effect on health. Vinegar is the right option for gardeners who look for an eco-friendly product that’s both affordable and safe. White distilled vinegar has numerous uses in the garden. You’ll be surprised to learn more about its real power. You can find it in every store, and again, it’s cheap and safe for you and your family. Clay pots are amazing since they keep the soil moist, and protect the roots during hot summer days. Let’s not forget the fact that these make your garden look beautiful. But, clay pots tend to absorb minerals, calcium, and salt from the water and the fertilizers which makes them look unattractive. But, white vinegar will help you make your clay pots look bright and clean again. Here’s what you should do. White vinegar is the best organic insecticide. 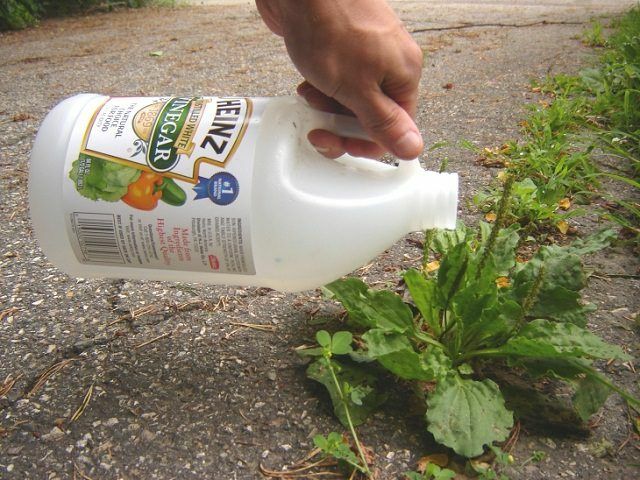 Spray the affected areas, and ants will disappear in no time. Spray again after few days, and you will never ever see an ant in that spot. Add 2 tablespoons of vinegar and a teaspoon of sugar in one-quart vase. Put your flowers in this solution, and change it every 3-5 days. This solution is some sort of “food” for your flowers. White vinegar is one of the most efficient “anti-weed” products. Combine three parts of water, one part of vinegar and a teaspoon of dishwashing agent into a sprayer. Shake the content, and spray your garden. Use undiluted vinegar on your tools. Spray them with the vinegar or just dip them in it for a few minutes. All you have to do next is rinse them well. If your plants don’t grow well or have dark spots on their stems and leaves, they’re probably dealing with a fungus or mold. White vinegar will help you get rid of these. Add 2 teaspoons of vinegar to brewed chamomile tea. Spray the mixture on your plants, and watch them become more vivid. Add 3 tablespoons of cider vinegar to 4 liters of water. Spray your roses to get rid of the fungus. First, rub the seeds using coarse sandpaper. Do this the night before you plant them. Make a solution using 500ml of warm water, 125 ml of vinegar and a squirt of washing-up liquid. Soak your seeds in it. Plant your seeds the next day, and enjoy watching them grow.